I don't have optimal soil or sun conditions, and a really full garden, so my space for a veggie bed is limited. A few years ago, I started growing vegetables in containers, sneaking them into sunny spots between perennials and shrubs, here and there throughout the garden. I've discovered many vegetables grow well in containers--tomatoes, peppers, zucchini, eggplant, carrots, beets, turnips, squash, and even potatoes. Actually, especially potatoes! Here's how to do it. First you need potatoes, ideally small ones which are better suited to the confined space of a container. I select smaller varieties and grow them to maturity (harvesting about a week after the foliage has died back). Another option is to grow full-size potatoes but harvest them early as baby potatoes before they reach full size (about a week or two after flowers form). Last year I grew 'Bintje' (above). 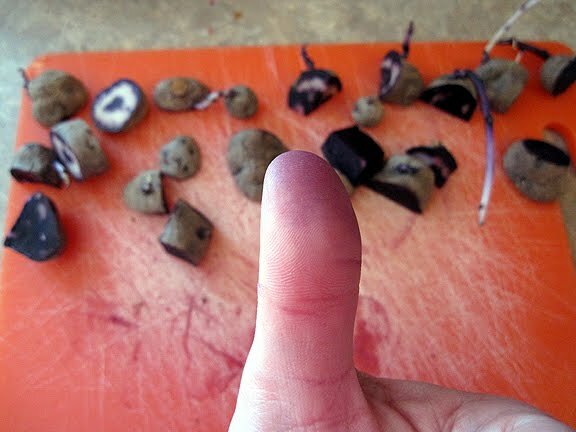 This year I'm growing 'German Butterball,' 'Purple Peruvian,' and 'Red Norland,' all purchased as seed potatoes (the first three from Landreth, the latter from locally-owned Downtown Home and Garden). 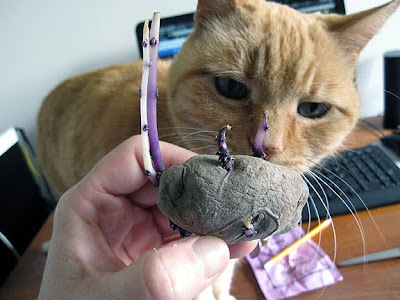 Some people purposefully wait for their seed potatoes to sprout before planting them. This is called chitting and is achieved by storing the potatoes in a dry place at room temperature a week or two before planting. 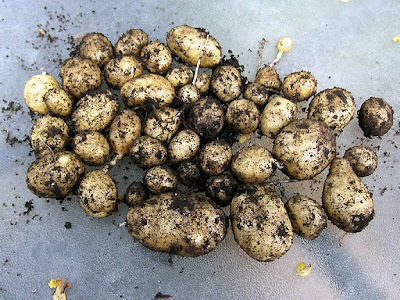 Chitting shortens the amount of time it takes the potatoes to sprout and mature. Some of my potatoes chitted accidentally because my storage area wasn't cool enough. I found it a bit difficult to handle and cut the potatoes without breaking off some of the sprouts. Whether or not your eyes have sprouted, cut the seed potatoes into pieces so there are three eyes (or buds) per piece. Note: Dark potatoes like this 'Purple Peruvian' will stain your fingers, but it washes off easily. You can use any large container, provided you drill drainage holes into the bottom. I use plastic storage bins because they're lightweight and inexpensive. They're on sale now for back to school and will be again after the holidays. I got the one shown here at a big box for $4 after Christmas. For filler, I like a 70/30 combo of compost and a good soil mix. The City of Ann Arbor gives out free compost in spring, so I load up there. You can adjust the ratio for your own needs. Potatoes don't need rich soil, but I think they grow much better in a container with it. 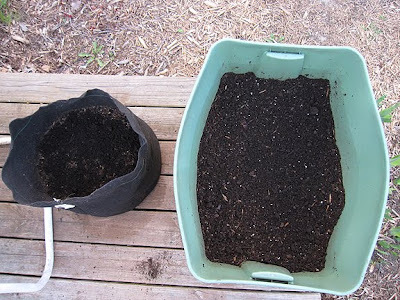 Fill your container about a third with your soil/compost mix. 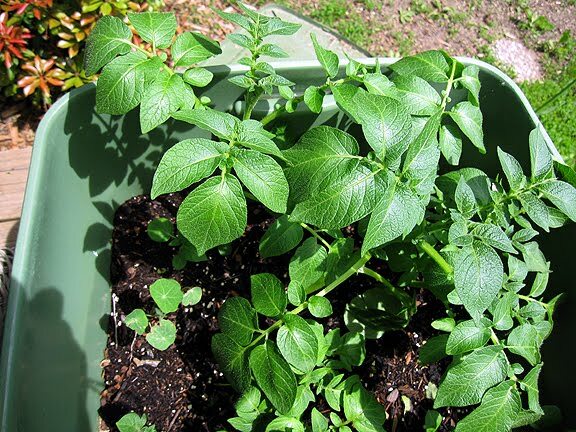 Plant each potato piece so it's sitting about an inch from the bottom of the tub and is covered in the rest of the soil. Plant so a cut edge is facing down and the eyes are facing up. I want to tell you I planted the pieces 6 inches apart, but it was likely more like 3 inches. I varied the planting depth a little, to create more space. Potatoes like full sun, so if you have it, great! If you don't, don't worry. Potatoes are forgiving. Once my trees leaf out, my bin only gets four to six hours of a sun a day and the potatoes did fine. 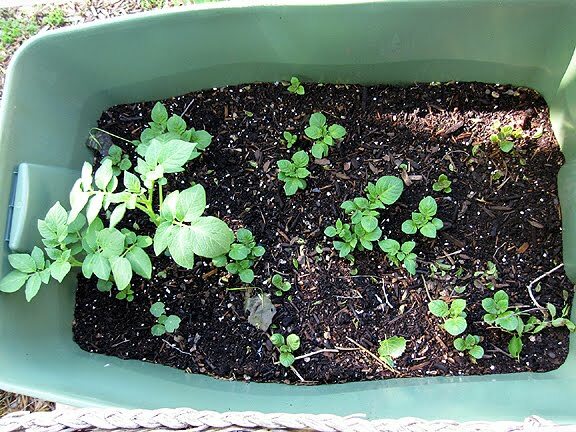 Here is the bin with the potato pieces planted. This year, I also planted in a potato sack, which my mother wasn't using. The instructions are the same, except you don't need to drill holes because the material is porous, and not as many potatoes fit into it. Otherwise, results were the same. 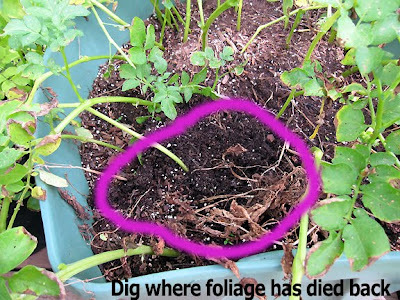 In-ground potatoes can be planted when soil temperatures reach 45F. I plant mine in the bins at the end of April here is southeastern Michigan, where the last frost date is mid-May. I water my potatoes once a day, like I would any container. Don't worry if your potatoes don't grow evenly at first. The shorter foliage will catch up in a few weeks. The heights have evened out now at about 8 inches tall. 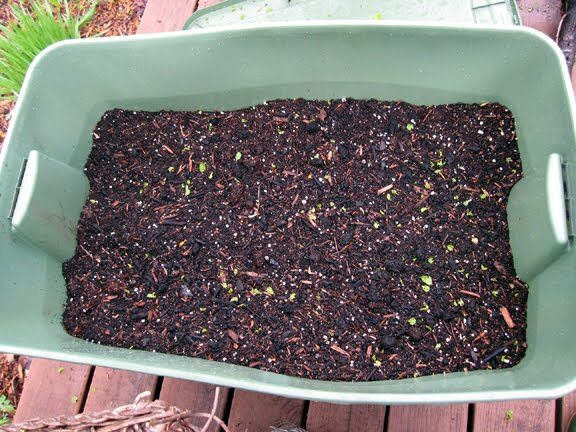 At this stage, you want to add more soil into the bin, which is the same concept as mounding soil around a plant growing in the ground. Add about 2 inches of soil mix, being careful not to break the stalks. As the potato stalks grow, keep adding more soil into the bin in stages. This is not an exact science; I add 2 inches each time the foliage gets to be about 8 inches over the soil line. 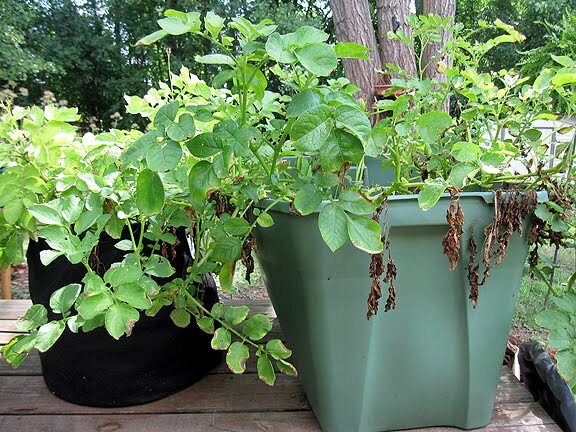 When you've added enough soil to be about 2 inches from the top of the bin, stop filling it. You need at least that amount of clearance so that water has a place to collect without overflowing in heavy rainfalls. 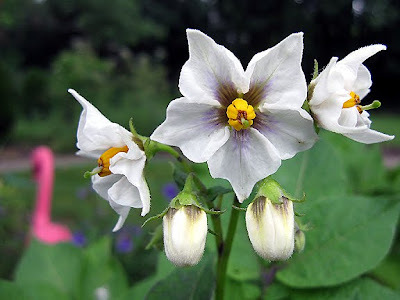 Eventually the potatoes flower (these are 'Peruvian Purple'), bees pollinate, and the potatoes grow. After about three months, you'll notice that much foliage is still growing, but some has died back. Potatoes are ready to harvest a week or two after the foliage is dried out! Carefully dig in the areas where foliage has died, leaving the remaining stalks intact. There's nothing I like more than sticking my arm elbow deep in warm earthy compost and rooting around for potatoes. And it's so much easier than digging. Ta da! 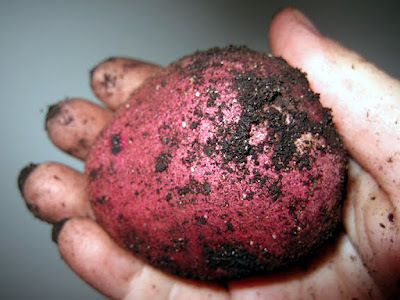 My first potato of 2011, a 'Red Norland,' harvested on July 27. They are so good eaten right after harvesting--I ate this one raw, like an apple. I'm going to do a second planting in the next few days, as soon as I harvest everything currently in the bin. I'm not sure if there's enough time for a second harvest, but I'm going to see what happens. Three months from now will be Halloween. Since potatoes can handle some cold, I'm hoping they will finish by then. I'll let you know. Another advantage to growing in a bin is you don't have to worry about crop rotation. I dump the compost/soil mix onto my veggie bed at the end of the season, wash the container with a solution of 9 parts water to 1 part bleach, and fill it with fresh soil next year. I can use the same container over and over again, and I save some potatoes to start next year, too. This is a great idea; thanks for all the clear instructions, Monica. I don't grow potatoes because they take up too much room in my small vegetable garden, but it would be nice to harvest my own. One of my earliest memories of gardening is watching my mom cut up seed potatoes, and then helping plant the little wedges in the furrows Dad had made with a small plow. The ones I buy in the supermarket these days just aren't what they used to be! Monica thanks for sharing those great potato tips. I'm glad I don't have to go out and buy those fancy potato bags that cost way to much! Great idea and good instructions. Have been looking for ways to increase my veggies without losing flower space! this would work fine. Great tutorial Monica. We're going to have to try our tomatoes in containers next year because they're just not doing well in the ground. Especially since I love the heirlooms and most are not wilt resistent. PS The fuschia flowers are 4 o' clocks. I have a few shades of pink now that they've combined with the yellow but the fushcia are my favorite. If you want any seeds give me a holler. I have been telling anyone that would listen that plastic bins are a great asset when it comes to growing or gardening. They can be cleaned out and used over and over for years. Very nice! That is a good crop of potatoes. I like the idea of being able to get all the potatoes out at the end of the season and not having to worry about them sprouting again at a later date. P.S. Just heard we hit a new record high of 101-just beat the last record set in 1953. Baby it's hot outside! I think I might have to move to Michigan! Every time I want to make a very nice potato salad, I am searching for the right potatoes. Thank you for your instructions!! Now I have to find the right seed potatoes in Canada. This might just work for us! I also have happy memories of growing potatoes in England with my grandad. Loved digging them up! Thanks, Monica! I think the plastic buckets will work better than the thin plastic potato planter in my hot sunny garden. As you know, my potatoes growing in the thin plastic potato planter collapsed in the intense heat in July. It so good to share! I've tried potatoes in a tall yard bag for two years running and they've been a huge disappointment. Perhaps the bag was too porous and I couldn't keep them moist enough in the hot weather. This year, I'm giving them on more try in a plastic garbage bin. Cross your fingers for me!